Whim W'Him company members Tory Peil, left, and Mia Monteabaro in Olivier Wevers' "Brahms and Tights"
When you’re just about fed up with dark, wet January in the Pacific Northwest, there’s nothing like a bracing dance performance to shake you out of your doldrums. Seattle’s Whim W’Him delivers on that score with its latest production, INspired. 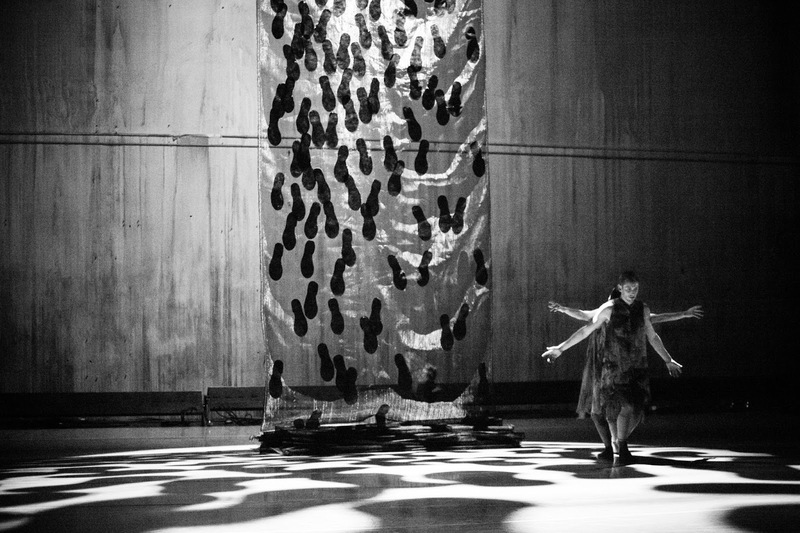 When Artistic Director Olivier Wevers formed the company in 2009, most of Whim W’Him’s repertoire was Wevers’ own work. Early on, though, Wevers added dances by Anabelle Lopez Ochoa to his programs. Now “Whimmers” have come to expect a smorgasbord of work by different choreographers. This January's production fit the bill to a tee. 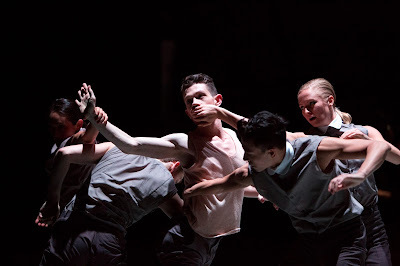 Whim W'Him company members surround Patrick Kilbane, center, in Dominic Walsh's "The Ghost Behind Me"
I’d be grasping at straws to find any real connective tissue between these three pieces, other than the consistent excellence of the seven Whim W’Him company members who performed them. 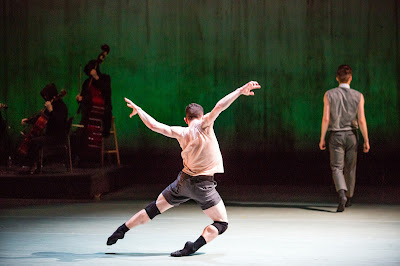 In particular, newcomer Patrick Kilbane, a Bainbridge Island native, dazzled with his ballet-honed technique. Kilbane can’t replace longtime company member Lara Seefeldt, who departed last fall, but he’s a welcome addition to the troupe. 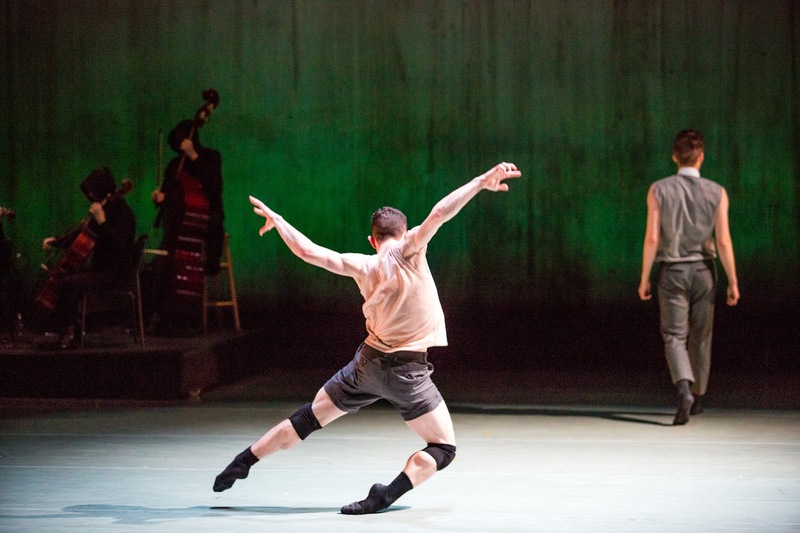 Patrick Kilbane, front, in "The Ghost Behind Me"
The last dance on the INspired bill, Dominic Walsh’s work, “The Ghost Behind Me,” was perhaps the most ambitious of the three new works. Performed to live music by the Two Star Symphony, this piece centered around Kilbane as a character called Protagonist. His movements are orchestrated by Justin Reiter’s Puppet Master, and echoed by the other dancers as a Greek chorus of fellow puppets. Kyle Johnson appears as a challenge to this norm--The Man who tries to engage Kilbane’s heart. Or at least, that was my reading. It’s always a treat to see strong work by choreographers who are new to me, and there was a lot to like about “The Ghost Behind Me.” The puppet characters in particular had the task of showing us their carefully articulated muscle movements, controlled by the Puppet Master. He was even given a hand-controlled spot light to highlight and follow the action onstage. Lighting Designer Michael Mazzola created a large forbidden rectangle mid-stage; the puppet/dancers edged around its perimeters, curious about what it held but somehow kept at bay. As intrigued as I was by the mini-world Walsh created, I was puzzled by the choice to costume the musicians and Reiter’s Puppet Master in nondescript brown hoods and long, bizarre blue beards, ala ZZ Top. I’m not sure what those beards meant to convey, and to me, they only distracted from Reiter’s performance. Whim W'Him company members in Mark Haim's "Overflow"
Mark Haim’s new work, “Overflow”, is set to sonorous orchestral sections from Richard Wagner’s opera “Tristan and Isolde.” The music is measured and slow, a fitting accompaniment to an impressive set piece by Corrie Befort, which gradually unfurls behind the dancers. Haim dedicates “Overflow” to “my mother, an immigrant, and my father, a refugee.” For me, this measured work was a melding of melancholy emotion with demanding movement. Perhaps it was Wagner’s music, but I felt a bit overwhelmed by heaviness as I watched the dance; almost as if I had succumbed to a hypnotic trance. Patrick Kilbane and Tory Peil in "Brahms and Tights"
The program opened with the lightest of the three pieces, Wevers’ “Brahms and Tights.” For me, this sprightly ballet, with its bright blue and green costumes by Ronalee Wear, was the most successful dance on the bill. Wevers spent most of his career as a principal dancer at Pacific Northwest Ballet, and he returns to his roots with this work. Set to Johannes Brahms’ “Violin Concerto in D Major, Op. 77”, the dance moves through solos, pas de deux and set pieces for all seven Whim W’Him dancers. Kilbane, Reiter and Mia Monteabaro stand out in the work, leaping, pirouetting, then breaking the elegant ballet lines with a sickled foot or a pedestrian stroll across the stage. Whim W'Him company members in Olivier Wevers' "Brahms and Tights"
I was struck by a Rube Goldberg-esque lineup near the end of the piece. One by one, each dancer takes a moment to perform alone, then taps the next in the line to take his or her turn in the spotlight. “Brahms and Tights” doesn’t have a deep message to impart; it’s a well-made, well-performed romp of movement and music. On a wet, dark, winter evening, it was just the tonic I needed. A lot of talent was on the stage the night of the dance! I love when the dance i am watching is telling a story, its very intriguing to me! I will definitely be there the next time INspire performs! Woo Hoo! A New Year, More New Dance!